Following the Annual QSR Drive-Thru Study conducted by SeeLevel HX, Chief Sales Officer Ken Lundin and QSR Magazine Editor Sam Oches hosted a webinar to present the findings. This report highlights the top 5 key findings and actionable insights from the study. 1. DOES SPEED OF SERVICE STILL MATTER? We’ve always known total times matter. However, studies show that customers are perhaps more concerned about service times and are okay with a little longer wait time. Do QSRs need to be faster or slower? Or do they need just to focus on consistency? The 2018 QSR Drive-Thru Study showed that speed of service is not the most important thing. Look at Chick-fil-A, who ranked last for speed of service, but is the most likely to be recommended to friends and family members. WANT THE WEBINAR PDF SLIDES? Download them while you watch. 2. HOW MUCH ARE ORDER INACCURACIES COSTING YOU? Order accuracy offers business implications across all business fronts – brand loyalty, throughput, slower or faster service times, etc. When we analyze order accuracy from 2017 to 2018, there was a dramatic change. In 2017, across all brands in the study, 1 in 5 orders was inaccurate. In 2018, that number shifted to 1 in 10 orders. There are gross margin and sales implications that come from order inaccuracies. Can you say for certain whether or not your corporate policies and best practices are making it all the way to your individual store locations to ensure brand loyalty and customer retention? Are your individual store locations working diligently to increase order accuracy? As shown in the above chart, an inaccurate order can cost you half a minute in total service time. Assuming there are almost 22 inaccurate orders in a single day (or roughly 8,000 transactions in one year), that could lead to up to $51,000 in yearly lost revenue specifically for inaccurate orders. Any operational components slowing down your drive-thru amount to lost revenue. Discover what your QSR can do to improve order accuracy. 3. CAN DIGITAL MENU BOARDS SPEED UP THROUGHPUT? We were curious to see how many QSRs currently use digital menu boards, and for those that do, how effective the menu boards are at speeding up throughput and influencing customers’ decision-making. While we learned that only 10% of the quick-service restaurants that we shopped had digital menu boards in place, the effectiveness of them proved great. From the 2018 QSR Drive-Thru Study, we discovered that digital menu boards can, in fact, speed up throughput in the limited environment that they exist. QSRs with them had a total service time of 268.4 seconds; those without had 302 seconds in total service times. That’s reducing total service times by roughly half a minute with digital menu boards place, a number discussed above that could save your restaurant tens of thousands of dollars per year. When considering the shift to digital menu boards, keep in mind other benefits such as visual appeal and the flexibility of which menu items are displayed at any given time. This includes the ease of promoting new products or seasonal items on sale. • Customers’ eyes go to the middle first, then right and then left. • Highlight higher margin items with pictures on the left and right. • Only place less than 10 items per screen. We are interested in the input of QSR decision makers as to what leading-edge trends and throughput optimization factors are being implemented in the industry. Your insights will drive the survey and key findings of the 2019 QSR Drive-Thru Study. To participate in the study with shops to your quick-service restaurant or to add specific questions on the survey, contact Chief Sales Officer Ken Lundin. 4. DOES SUGGESTIVE SELLING INCREASE THROUGHPUT? Suggestive selling is never a fun task to complete, especially after already hearing no once. 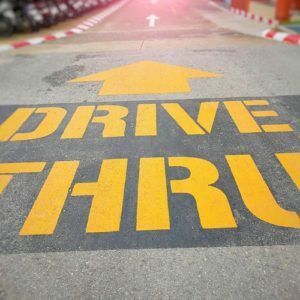 But the study showed that those who do follow through with suggestive selling generate more throughput in the drive-thru, gaining just under 30 seconds in total service times. How do your individual store locations test and market new or featured products and implement best practices to promote them? Discover actionable insights to perform better and gain more market share with SeeLevel HX. 5. HOW CAN YOU STEP AHEAD WITH MOBILE APP ORDERING? With the advent of innovation in ordering through QSR mobile apps, quick service restaurants have the opportunity to increase throughput and operational efficiency in their drive-thrus. While many QSRs have mobile apps and the ability to order online, the promotion of this innovation is still low. Even if the signage was present in the store, many customers didn’t notice it. When mystery shoppers were asked if there was parking available for those ordering from the mobile app, then they might have seen the mobile app signage as well. But still, the signage was an afterthought. McDonald’s, is taking the biggest step in the QSR industry to promote their innovation in ordering, with Chick-fil-A and Wendy’s following behind. Other than those three, however, the promotion of mobile app ordering for QSRs is almost nonexistent. An absolutely massive opportunity to separate yourself from the competition? Utilize real estate for parking spaces reserved for people who use your mobile app to order online and pick up in-store. Then, use effective and prominent signage to promote innovative ordering options to customers. WHICH QSR TOOK THE LEAD? Ranking in the top five in all four of our main study categories, Arby’s came out on top in the 2018 QSR Drive-Thru Study. Their consistency in order accuracy, customer service, taste and speed of service proved to enhance their overall customer experience. Chick-fil-A came in second, ranking first in three out of the four categories. However, they didn’t place in the top five for speed of service at all. It goes to show that speed of service is not as important anymore, especially when you look at the fact that Chick-fil-A still came in as the most likely to be recommended to friends and family members (highlighted in the speed of service section above). Are the things industry leaders used to think were essential to gain market share still important? Or should you be testing other components in your QSR to better understand customer expectations? And that is an amazing number when you think of brand loyalty and throughput for your QSR, saving you tens of thousands of dollars per year. Do you know for certain how your location compares to your competitors? Are you interested in growing your market share and increasing the customer experience? Improve brand loyalty and drive-thru throughput with actionable insights from our mystery shopping and market landscape services. Contact us to get started today.